Dutch-born, Dublin-based visual artist Anita Groener’s latest exhibition, Citizen, is currently on show in The Butler Gallery located in Kilkenny’s 12th Century castle. Featuring a range of mediums – drawings, video pieces and installation work – the show, as allude to in it’s title, addresses the modern notion of Citizenship and the current migration crisis in Europe and the Middle East. 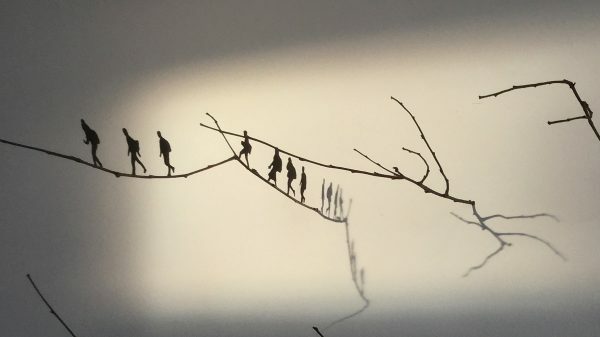 Groener has delicately created a number of installations using silhouettes of people crafted from real life individuals found through online imagery. While this creation of anonymity may initially be viewed as having a de-humanising effect on her subject matter, it in fact has the opposite. All individuals, the viewer, the artist and the subject occupy the same plateau on equal footing. Theses silhouettes can be seen living among birch twigs and in a seemingly never ending lines. At the core of the exhibition is a dual video presentation, one entitled Blink, the other Fugue. The latter is a handheld video piece of a person travelling through a forest (we are not told of they are running away or chasing something), the former a rapid fire series of images made up of the people who formed the silhouettes. While the work casts a light on the recent mass migration into Europe by refugees from Syria and beyond, it’s also a comment on the greater issue of homelessness around the world and a powerful one at that. Citizen ends today so be sure to catch it before it’s gone.